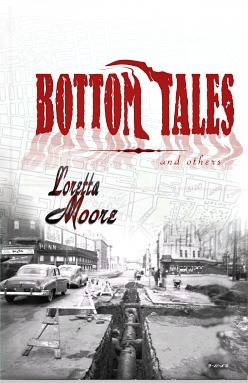 Loretta' Moore's new book BOTTOM TALES AND OTHERS is collection of short stories about "The Bottom," an African American community that existed until the early 1960s in the city of Philadelphia. PHILADELPHIA - Aug. 18, 2016 - PRLog -- A glimpse into a lost world: a slice of time, forever lost to us, brought back to life by author Loretta Moore. With words woven into a brilliant tapestry of daily life in "The Bottom," this talented debut writer carries the reader back in time, through her narratives and short stories. From the early 1900s to the mid-to-late 1950s, a part of Philadelphia once existed, a vibrant and self-contained African American community that was known as "The Bottom." It was a place that transcended the physical infrastructure of the city. It was a place with a living, breathing soul. Through urban renewal and redevelopment, a part of history was lost to us. It was carried away by cranes, bulldozers, and wrecking balls. The living heart of a community was replaced with soulless, concrete and steel edifices—efficient, modern, yet somehow cold and lifeless. The Bottom ran roughly from 33rd and 40th streets east and west and to Lancaster and University Boulevard in what Philadelphia city planners called Area 3. The neighborhood, originally known as Greenville, after World War One, operated as an expended family in this African American community, helping to ensure the safety and prosperity for all of its residents. Parents didn't worry about their children, and doors were left unlocked. However, all of this came to an end with the advent of federally planned "urban renewal" that bulldozed the Bottom out of existence and replaced this close-knit community with soulless urban high-rise housing, displacing over 5000 residents. Although this once-vibrant neighborhood is gone, it has not been forgotten. In 1984 a reunion was held by its former residents, with the City of Philadelphia annually honoring the memory of the Bottom on the last Sunday of August. Nor have the tales of its residents been forgotten, as illustrated by the work of Loretta Moore. When asked about the neighborhood's inspiration, the author said, "When I began to write about "The Bottom," my thoughts trailed back to surroundings fertile with the magic and mystery I experienced growing up there. As for my short stories, I was inspired through imagination and observation, with a couple of them from my own experience." It is in Bottom Tales and Others that Loretta Moore raises that forgotten era, like a modern day Lazarus, breathing life back into a lost community through her storytelling. "Moore is a skillful writer," Leo Publishing noted. Loretta Moore resides in Dover, Delaware, and is married with three children and eight grandchildren. This African American author is multi-published with novels, poetry, and plays—two of her productions having been performed in Philadelphia and New York City. She has a college degree in English and has received literary and theatrical recognition and awards. Fans of Douglas Adams, do not fear! Brent D. Seth is here!